Upon arrival to our office you will be warmly greeted by the front desk staff. The staff will take your paperwork and give you a tour of the office to show you where everything is located and what to expect. After that you will be escorted to the exam room and introduced to Dr. Travis Howell. This is where the consultation and comprehensive exam will be preformed. First, the doctor will go over your past health history and any current concerns. Second we will explain how chiropractic care works and what to expect. We find, the more you know about us and the more we know about you, the more we can help. The third component of the visit will be the comprehensive chiropractic examination. This is a multi-step component and may vary depending on your needs. The exam is designed to find the specific cause of your current health challenge(s). The first step will be a computerized exam of the central nervous system. This portion of the exam will give us your COREscore and provides us with a complete evaluation of the tension affecting your spine and the nerves that are inside of it. After the scan, will assess how well you move. You will be asked to perform a series of movements to better evaluate how you body is currently functioning. Sometimes we will need to see an X-ray to obtain additional information and to further evaluate your case. In this case we will set-up a same-day appointment at the local radiology group for you to have the requested studies performed. We do not have an X-ray unit on-site. After gathering all this information, the doctor will have what he needs to develop an effective and efficient care plan to address your current health challenges. The first visit is extensive and thorough, but you can expect to be out of the office in about an hour. 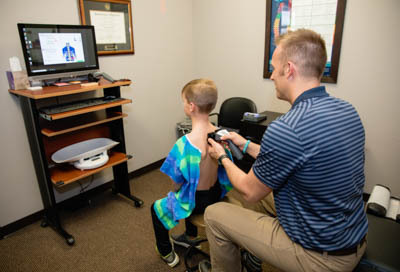 Call our Davenport office to schedule your consultation and comprehensive exam today!